You've seen the Liberty Bell and Independence Hall. Come now on a tour of the city the Founding Brothers lived in, a smaller city than today which they knew intimately. Their Colonial Philadelphia can be seen in a day's walk through the center of town. The new Constitution Center is an imposing anchor to the north end of Independence Mall, almost as large as an airplane hanger. Unlike the other main components of the Mall, it is neither an antiquity itself nor mainly devoted to displaying relics, and it lacks the National Park Service image of relentless scholarly custodianship. Rather, it seems to strive for public diversity and involvement, and probably would not mind an occasional wiff of controversy. Somewhere there lurks a trace of that ancient controversy between Jefferson and John Adams, the controversy between the Declaration of Independence and the Constitution, ultimately reflecting the distinction between spontaneous town-meeting democracy and reflective republican governance. Some even worried that the Supreme Court might be uneasy about a citizen center telling the world what the Constitution is, because the Justices see Constitutional interpretation as their own unique function. The sensitive point is the emphasis on the words "We, the People", which could be seen as urging easy modification of the document by shouting demands or repetition of certitudes without demonstrating any particular "standing" to justify consideration. The second floor of this enormous new building is devoted to some very skillful exhibits relating to the history and significance of certain features of Constitutional history. The many auditoriums are the site of public lectures and programs, and there is a very interesting set of life-sized bronze figures of every member of the original Constitutional Convention. A striking feature of the display is to show how short and inconsequential Hamilton and Madison seemed to be in person, while Ben Franklin and Gouverneur Morris appear imposing and formidable in the flesh. These things matter in politics. Cross Arch Street to the Free Quaker Meeting House, and if you have called the Park Service in advance, perhaps you can visit, noting how visually dramatic a design of drastic simplicity can be. Just across Fifth Street is Ben Franklin's gravesite, in Christ Church cemetery, extended to this location when the gravesites became full around the church itself. Going down Arch Street from Fifth to Fourth, you can visit the orthodox pacifist Meeting House, its interior largely unpainted and grimly plain -- quite different from the effect of pristine simplicity of the Free Quakers. In passing, glance at the warehouses on the left, covering the site of what was a major factory for shoes and uniforms for Union soldiers in the Civil War. Behind those buildings on the North side of the steet, as the ground slopes sharply toward the river, you can sense the rough, tough waterfront of the Eighteenth Century. Charles Dickens might have felt entirely at home in the Nineteenth Century. Looking three blocks further North up Fifth Street, you can see St. George's Church, the oldest Methodist Church in the world, its view unfortunately obscured by the approaches to Ben Franklin Bridge. Continue down Arch Street, past the building once said to have been the house of Betsy Ross, turning a half-block to the left on Second Street to the head of Elfreth's Alley. Continue down the alley to the end, overlooking the waterfront. Note Admiral Dewey's flagship Olympia ("You may fire when ready, Gridley") on the Philadelphia side of the river, and across the Delaware River on the Jersey side, the Battleship New Jersey, that last and largest of American battleships. Going down Elfreth's Alley, observe how crowded-together the Colonial buildings are. That's a reminder that placing taxes disproportionately on land will result in small residential plots, even though a whole continent of vacant land stretches to the Pacific. At Front Street, walk South to Market, and then right to Second and Market. In passing the corner of Front and Market, do not neglect to notice the Southwest corner. It's been demolished, but here was the site of the London Coffeehouse, where it could be fairly argued the American Revolution began. The owner, John Bradford, first learned of the Tea Act from a sailor at the Arch Street Wharf and fiercely resolved to stir up trouble about it. In retrospect, while the Revolution might seem justified, the Tea Act itself was intended by the British to be conciliatory, actually lowering the price of tea. For this reason, John Dickinson found himself out of step with the rebels he had incited to rebellion; he refused to sign the Declaration. In the Stamp Act, the British were actually trying to reconcile with the colonies, and he urged restraint. Although he was much respected, he was brushed aside. There were no signers of the Declaration of Independence who were official Methodists, for the simple reason the Methodist Church was not created until 1784 when John Wesley, secretlyordained its first ministers. However, there is room to believe the movements eventually creating the Methodist Church played a central role in American agitation for independence. The origins are a little confusing. John and Charles Wesley were both priests in the Church of England, and John famously declared, "I will live and die an Anglican." While at Oxford, they founded a bible and ethical study society which came to be called the Holy Club, and because of systematic thoroughness were familiarly known as Methodists. Systematic study of the bible in small class groups was a central feature. There was no dissatisfaction with, or rebellion from, the Church of England. Missionary zeal was a second early feature of the group, and some early missionaries like Bishop Francis Asbury were especially active in the American colonies. When Asbury came to America there were 1200 adherents of the general concepts, and when he died there were a quarter of a million formal members of the church. This rapid growth soon became its main problem, because the Anglican Church simply could not supply enough priests, and so the local congregations demanded the right to ordain their own ministers. Wesley agreed, but did it secretly. America was a long way from England, and the idea of a local church, independent of England, soon made its appearance, particularly as local practices began to diverge from the Anglican ones. Missionary zeal soon evolved into a more exhortational evangelism. In Pennsylvania Quaker country, restlessness with Quaker silence produced a reaction of joyous outcry during religious meetings, creating the description "shouting Methodists". Hymn singing was important as a result of Charles Wesley's influence, and many Methodist hymns have been adopted by other Protestant denominations. Drunkenness was a major problem in the colonies, and anti-drunkenness or temperance, was a main feature of Methodist attention. A century later, Methodist ministers were to found the Salvation Army, which embodies many of the principles of evangelical, hymn singing anti-drunkenness crusading. From its earliest days, Methodism welcomed blacks into membership, although a segregationist strain to it ultimately caused trouble. A central figure in the configuration of the early Methodist Church was John Newton, the captain of a slave ship. After nearly perishing in a storm, Newton attributed his rescue to God's intervention, writing the famous hymn, Amazing Grace. He spent the rest of his life in evangelical activities, with particular emphasis on black people. Although his American visit preceded the formation of the Church, George Whitefield the evangelical preacher played a major role in preparing the Colonial Philadelphia populace for the concepts of Methodism. He attracted great crowds to his sermons, and Benjamin Franklin describes in his autobiography the great impact Whitefield had on him. Now, as it happened, the German Reform church had started but was unable to complete a church building at 235 North 4th Street, which was sold at auction to members of the local Methodist Society. This church building, started in 1763, purchased in 1767, and completed in 1769, can fairly claim to be the oldest Methodist Church building in continuous service in the world, although the dates of these things are pretty confusing for a church officially created in 1784. Just to make things more difficult to understand, Barratt's Chapel, ten miles south of Dover, Delaware, was completed in 1784 on land donated in 1780. If you say it slowly, you can see that it is possible to describe Barratt's Chapel as the oldest house of worship built by and for Methodists. John Wesley's chapel, on City Road, London, is however still the mother church, so to speak. 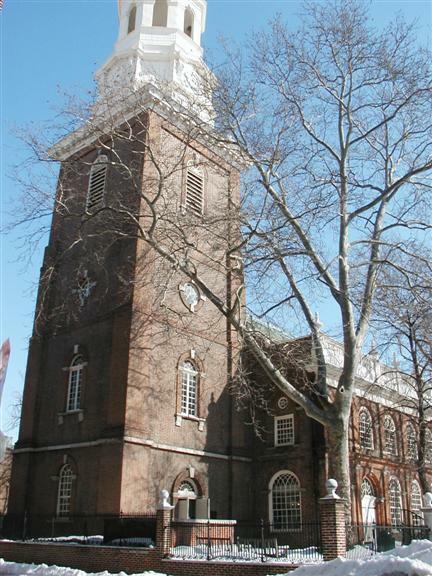 St. George's Church in Philadelphia is notable for ordaining the first black minister, Richard Allen, who had been born a slave of Benjamin Chew (the Chief Justice, whose house was Cliveden, the scene of the Battle of Germantown). Allen was obviously a remarkable person, who bought his own freedom by working as a shoemaker, and who later drove wagons from Rehoboth, Delaware to Valley Forge during the Revolution. (Allen had actually been sold by Chew to Stockley Sturgis, a Delaware plantation owner, who is the one who remorsefully sold him his freedom). Allen often preached five times a day, built up a huge following in the black community, and broke off to form the African Methodist Episcopal Church. The first Church was Bethel, replaced several times at 6th Lombard Streets,, but there are now many others across the country. Visitors from New Jersey, crossing the Benjamin Franklin Bridge, will be able to see the top half of St. George's Church as they descend into Philadelphia. At Christmastime, the windows are lit with real candles, and the interior is a beautiful simple white room. It now has less than a hundred members, but houses the genealogy and other church records for a wide area, and is very popular with people doing research. The bishop's chair dates from Bishop Asbury. Barratt's Chapel is smaller and simpler, but the highway makes a wide swing around it and its burial ground, so it remains a prominent feature of the area around Frederica. It takes several minutes to drive around it, even at high speed, on the way to the Delaware beaches. Wesley College is not far away. Stockley (currently pronounced Stoakly) is commemorated as the name of a small town on the highway, twenty miles south of here. Stretching from Independence Hall east to the Delaware River is another mall filled with historical buildings like Carpenters Hall , the First Bank(Girard's) and Second Bank (Biddle's), the Old and the New Custom houses, the American Philosophical Society, and others. The eastern mall was the property of the State of Pennsylvania when it was created, but it soon seemed more economical to the frugal rural legislature to turn it over to the federally funded National Park Service, joining the mall stretching northward. Well, somebody got another ton of federal money appropriated, and now we are filling the north mall with buildings which largely hide Independence Hall from the passersby. With just a few more Congressional earmarks, the imposing beauty of the mall will be submerged, but it hasn't quite reached that point yet. There is a perfectly enormous New Visitors Center, containing a couple of auditoriums and a big bookstore. Mostly the concept seems to be to provide a place to get out of the rain if you are an out of town visitor, provide public bathrooms, and a place to get a hot dog. At least the visitors center is red brick, and arched, with white woodwork. At the far northern end is an overwhelming stark granite block of a building, which will open July 4, 2003. It is a Constitution Center, claimed to be an interactive museum, and we shall see what we shall see. The looming monolith overwhelms and blocks the view to Independence Hall, and it better be good, when the insides get finished. By General Subscription for the FREE QUAKERS. Erected in the Year of OUR LORD 1783 and of the EMPIRE 8. The Quakers who built this building seem to have thought they were part of a new empire, but that implies an emperor, and of course, one was never created. Three years after the dedication of this building the Constitutional Convention met in the same Independence Hall, and our national form of government was somewhat strengthened from the Articles of Confederation also written here. Benjamin Franklin had a hand in both documents, but the first one was mainly composed by John Dickinson, and the second one by James Madison. If you go into the Free Quaker building, it seems to be a single large room with an interior balcony, and a couple of small staircases in the back leading down to what would presumably be restrooms. As a matter of fact, the Park Service extended the basement to include kitchen and dining room, and several offices for themselves which are a surprise if you are allowed to go down to see them. Charlie Peterson wrote a book about the restoration, but the main book about the spiritual history of this group was written by Charles Wetherill. Quakers, as everyone ought to know, are pacifists. The American Revolution put a number of them in a quandary because they agreed that Great Britain was injuring their rights by denying them a representative in the Parliament which ruled them but resorting to violence was another matter entirely. Eventually, a group did break away from the main Quaker church to fight for independence. They were prompt "readout of the meeting" , the equivalent of being excommunicated, not allowed to worship in the regular meeting houses they had helped finance or to be buried in the church graveyards. Samuel Wetherill was one of the leaders of this group, just as his descendants are the most active today in the surviving historical society. Samuel created quite a furor, demanding to use the Orthodox meeting house and burial grounds. He was, in his own view, just as much a Quaker as the others since no doctrine is absolutely fixed in that religion, and was freely entitled to speak his mind to persuade others of the rightness of his sincere positions. The main body of Quakers would have none of it, and the Free Quakers were firmly expelled, forced to hold a public subscription and build their own meeting house. Wetherill of course personally knew every one of the members who expelled him, and there may be some truth to his loud, pointed and unchallenged contention that the true division was not between pacifists and fighters, but between Tories and advocates of Independence. Whatever the truth of these accusations, it does seem in retrospect that the split was fairly divided between wealthy established merchants, and small shopkeepers and artisans. Quite a few now-famous names appear on the rolls of the Free Quakers, like Timothy Matlack the actual Scribe of the Declaration of Independence document, Biddles, Lippincott, John Bartram, Crispins, Kembles, Trippes, and Wetherills. When the meeting had dwindled down in 1830 to two lone parishioners, one was a Wetherill, and the other was Betsy Ross, herself. The north side of Dock Creek (now, Dock Street) was lower than Society Hill side, and somewhat swampy. The tendency to flood caused the north side to have smaller and less permanent buildings, and so it became the Colonial waterfront area remaining more commercial, and in parts, shabby, even during the 19th Century.. Still further to the north this was not the case, but the waterfront and food market patch more or less marooned Christ Church, now the single most graceful and elegant Colonial building still standing. This formerly commercial area is now called Old City, with many loft apartments mixed among surviving warehouse outlets, and of course the ethnic restaurants characteristic of such gentrified areas. Elfreth's Alley, running for one block east and west between Second and Front (1st) Streets. Some of the history of this street is obscure, so some of it is probably synthetic, because nothing particularly historic happened there to create detailed records. Elfreth's Alley claims to be the oldest street in America, a claim that can be substantiated back to 1702. The street is filled with little "workers houses", presenting a solid front of buildings on both sides of the cobblestoned street. Most of the houses could vaguely be called "father, son and holy ghost houses", looking as though they consisted of three rooms on top of each other, although in fact most of them are larger. A moment's consideration shows that the street consists of many double houses, with three doorways in front. Each house had a door to the interior, and most of them have a third door opening to a shared tunnel between the two houses, leading to the back yards. These tunnels were called "easements", a term that has migrated from its earlier usage. Although William Penn envisioned large single estates in his "Greene country Towne", he sold considerable land to people who remained in England as absentee landlords, who soon found that many small houses produced more rent than one or two big ones. One of the houses on Elfreth's Alley acts as a museum, with tours; there is an active civic association, and once a year in June there is a street fair. Because the land was swampy and the neighborhood congested, Christ Church soon outgrew its backyard burial ground, and burying important people under slabs in the walkways and corridors. Visitors who do not come from that sort of religious background are typically uncomfortable walking over such graves, a quite common arrangement in European cathedrals. But eventually, it was necessary to go several blocks westward to create a "new" burial ground. Most of the famous names from the Revolutionary era, like Benjamin Franklin and four other signers of the Declaration of Independence are found on the tombstones at Fifth and Arch, just across the street from the Free Quaker meeting house, and opposite the Philadelphia Mint. On the remaining corner of Fifth and Arch is the Constitution Center which will open July 4, 2003. It can already be seen that its architecture clashes with the rest of the historic area, but it is fervently hoped that its programs will redeem it. Combatants in a war often personalize the enemy in a single person. In 1776 the American colonists blamed it all on King George III. The British might have picked Sam Adams or Thomas Paine. Things are of course always vastly complicated in the affairs of great nations. Economics and national power are strong forces, like our culture, religion, and the accidents of geography and history. But when matters teeter on the edge of a cliff, insignificant pests can occasionally start an avalanche. Townshend had been a problem all his life. His mother was brilliant, and notoriously promiscuous. He and his father exchanged 2000-word letters explaining to each other how the other was completely wrong. Charles was witty, eloquent and charming when he wanted to be, and he married an enormously wealthy woman. After that, his family had no hold on him, and they rarely spoke to each other. The same charm and arrogance can be perversely effective in politics, so other politicians often just had to put up with him. But as politicians do, they roasted him in their letters and private conversations. His political opponent, Edmund Burke, was perhaps the most gentle critic when he observed, "His actions... seem never to have been influenced by his most wonderful abilities." Opponents, of course, welcome deficiencies in their enemies, while exasperated political allies can be the most scathing about team members who injure the party with misbehavior. Adam Smith referred to his employer as someone "who passes for the cleverest fellow in England." Chase Price described him as "utterly unhinged". Horace Walpole: "nothing is luminous compared with Charles Townshend: he drops down dead in a fit, has a resurrection, thunders in the Capitol, confounds the Treasury bench, laughs at his own party, is laid up the next day, and overwhelms the Duchess [of Argyll, his mother-in-law] and the good women that go to nurse him!" The final assessment of his biographer Sir Lewis Namier was "...illustrations of Charles Townshend's character can be picked out anywhere during his adult life. He did not change or mellow; nor did he learn by experience; there was something ageless about him; never young, he remained immature to the end." What matters for contemporary American readers is Townshend's 14-year grievance against American legislatures which seem to have originated when he discovered the New York Legislature in 1754 up to its old tricks of refusing to provide funds for Royal initiatives it did not like. At the time, he was in his first public office, the Board of Trade and Plantations, and had written some highly arrogant orders to New York, making many high-handed and disdainful public asides to his friends, including his wish to have the Assembly cut out of appropriations except for token approval of them. He was young, so his wiser party colleagues simply deflected him. But by 1767 he was Chancellor of the Exchequer, a brilliant speaker, and no doubt had collected many political chits to be cashed in. The Townshend Taxes were enacted, his underlying personal grievances were well known, the colonial assemblies could see it meant big trouble. Although almost no one could match Townshend for bizarre behavior, in Philadelphia at Front and Market Streets, there was another difficult personality, named William Bradford. As a printer and newspaper publisher, Bradford must have been a person of some note in a town of thirty thousand, but it is difficult to find a portrayal of him, and notes about his personal life are comparatively skimpy. We do know that he was a member of a family of newspaper printers, including grandfather, uncle, and son, all of whom had experienced official prosecution for defiance of government. His grandfather, also named William Bradford, is said to have had Quaker affiliation, but it is not particularly prominent in accounts of him, while almost no mention of Quaker affiliation is made of the rest of the family. Grandfather William had a notable apprentice named John Peter Zenger, who was prosecuted for libel against the Royal Governor of New York, defended in a famous trial by the Philadelphia Lawyer Andrew Hamilton, who established the principle that the truth is not a libel. We can rather safely presume that the younger William Bradford had grown up in an environment of hostility to authority, aggravated but not necessarily caused by some rather plain persecutions by authority. It may even have been specific hostility to British authority, since in 1754 young Bradford began publication of a specifically anti-British paper, The Weekly Advertiser. It is interesting to note that its principle competitor was a pro-British paper printed by Ben Franklin. Somewhere along the line, Bradford became head of the Sons of Liberty, clearly marking him as strongly anti-British, probably well before the Townshend Acts. Bradford established the London Coffee House at Front and Market Streets in Philadelphia. That might seem a strange sideline for a printer, until you reflect that the location was right beside the waterfront, especially the Arch Street warf. Newspapers in those days almost never had professional reporters, depending for their content on gossip from visiting ships. A coffee shop near the waterfront would be an excellent place to hear the maritime news of the world, and possibly hear it sooner than competitors. The London Coffee House provided a place for bargaining and trade; the Maritime Exchange got its start there. It may or may not be significant that a main activity of the Exchange was to buy and sell slaves. It is sure that the Navigation Acts and the Townshend taxes on various imports were a central topic of angry discussion in a waterfront Coffee House from 1768 to 1776. Thus it is possible that Bradford was caught up in the excited opinions of his customers, but plenty of evidence of anti-British sentiment exists in his background to suppose he nursed a long-standing prejudice against the British government. Our most authoritative account of the events appeared in the Pennsylvania Packet of January 3, 1774, but the beginnings of the story were better related in the Pennsylvania Mercury of October 1, 1791, shortly after Bradford's death. "After the Tax on Tea imported into America was reduced to 3d. per pound by the British Parliament, there appeared to be a general disposition in the colonies to pay it. In this critical situation of the Liberties of America, Mr. Bradford stopped two or three citizens of Philadelphia, who happened to be walking by the door of his house on Front-street, and stated to them the danger to which our country was exposed, by receiving, and paying the tax on, the tea. Many difficulties stared the gentlemen, to whom he spoke, in the face...; and it was particularly mentioned that the citizens of Philadelphia were tired out with town and committee meetings, and that it would be impossible to collect a sufficient number of them together, to make an opposition to the tea respectable and formidable. 'Leave that business to me(said Mr. Bradford),--I'll collect a town meeting for you--Prepare some resolves;--and,--they shall be executed.' The next evening he collected a few of such citizens who were heartily opposed to the usurpations of the British Parliament, who drew up some spirited resolutions to reject the dutied tea, and to send back the tea ship. These resolutions were adopted the Saturday following (October 16, 1773), by a large and respectable town meeting at which the late Dr. Thomas Cadwalader (a decided Whig) presided. The same resolutions were immediately afterwards (November 5, 1773) adopted, nearly word for word, by a town meeting in Boston, where a disposition to receive the tea had become general, from an idea that opposition to it would not be seconded or supported by any of the other colonies. The events (December 16, 1773) which followed the adoption of these resolutions in the town of Boston are well known. However great the merit and sufferings of that town were in the beginning of the war, it is a singular fact, and well worthy of record in the history of the events which produced the American Revolution, the First act in that great business originated in Philadelphia, and that the First scene in it originated with Mr. William Bradford." "Upon the first advice of this measure, a general dissatisfaction was expressed, that, at a time when we were struggling with this oppressive act, and an agreement subsisting not to import Tea while subject to the duty, our subjects in England should form a measure so directly tending to enforce the act and again embroil us with our parent state. When it was also considered that the proposed mode of disposing of the Tea tended to a monopoly, ever odious in a free country, a universal disapprobation showed itself throughout the city. A public meeting of the inhabitants was held at the State-House on the th October, at which great numbers attended, and the sense of the city was expressed in [the following] eight resolves:"
"1. That the disposal of their own property is the inherent right of freemen;that there can be no property in that which another man can, of right, take from us without our consent: that the claim of Parliament to tax America is, in other words, a claim of right to levy contributions on us at pleasure. "2. That the duty imposed by Parliament upon Tea landed in America is a tax on the Americans, or levying contributions upon them without their consent. "5. That the resolution lately enered into by the East India Company to send out their Tea to America , subject the payment of duties on its being landed here, is an open attempt to inforce this ministerial plan, and a violent attack upon the liberties of America. " "3. That the express purpose for which the tax is levyed on the Americans, namely for the support of government, administration of justice, and defence of his Majesty's dominions in America, has a direct tendency to render Assemblies useless, and to introduce arbitrary government and slavery. "4. That a virtuous and steady opposition to this ministerial plan of governing America is absolutely necessary to preserve even the shadow of liberty, and is a duty which every freeman in America owes to his country, to himself, and to his posterity". "6. That it is the duty of every American to oppose this attempt. "7. That whoever shall, directly or indirectly, countenance this attempt, or in any wise aid or abet in the unloading,receiving and vending the Tea sent, or to be sent out by the East India Company, while it remains subject to the payment of the duty here, is an enemy to his country. "8. That a Committee be immediately chosen to wait on these gentlemen, who, it is reported , are appointed by the East India Company to receive and sell said Tea, and request them, from a regard to their own character, and the peace and good order of the city and province, immediately to resign their appointment." The thinly-veiled threats contained in these resolutions against anyone who disagreed were soon made more explicit when the tea ship actually arrived at the mouth of the Delaware around December 23, 1773, by public posters to the Delaware River pilots and Captain Ayers of the incoming Tea ship, signed by THE COMMITTEE FOR TARRING AND FEATHERING. Cards were printed up for the public to distribute around the premises of James and Drinker, telling them to resign as sales agents for the Tea by writing a note, to be delivered to the London Coffee House -- William Bradford's place of business. A few shouts and the waving of a few torches would have been sufficient to indicate that the alternative was arson. A month elapsed between the proclamation of the Philadelphia resolutions and the actual arrival of Captain Ayers in our harbor. Another tea ship had arrived at Boston in the meantime on December 16,1773. The Boston citizens had dressed themselves as Indians, and dumped the Boston Tea consignment into the harbor, proclaiming the same eight Philadelphia-written resolutions. But in Philadelphia, violence proved unnecessary. James and Drinker resigned their appointments as sales agents, the pilots were ready enough to impede passage, and Captain Ayers on December 27, 1773 meekly sailed his cargo of Tea back where it came from. Jay Robert Stiefel of of the Friends Advisory Board to the Library of the American Philosophical Society entertained the Right Angle Club at lunch recently, and among other things managed a brilliant demonstration of what real scholarship can accomplish. It's hard to imagine why the Vaux family, who lived on the grounds of what is now the Chestnut Hill Hospital and occasionally rode in Bentleys to the local train station, would keep a book of receipts of their cabinet maker ancestor for nearly three hundred years. But they did, and it's even harder to see why Jay Stiefel would devote long hours to puzzling over the receipts and payments for cabinets and clock cases of a 1720 joiner. Somehow he recognized that the shop activities of a wilderness village of 5000 residents encoded an important story of the Industrial Revolution, the economic difficulties of colonies, and the foundations of modern commerce. Just as the Rosetta stone told a story for thousands of years that no one troubled to read, John Head's account book told another one that sat unnoticed on that library shelf for six generations. The first story is an obvious one. Money in colonial days was mainly an entry in everybody's account book; today it is mainly an entry in computers. In the intervening three centuries coins and currency made an appearance, flourished for a while as the tangible symbol of money, and then declined. Although Great Britain did not totally prohibit paper money in the colonies until 1775, in John Head's day, from 1718 to 1754, paper money was scarce and coins hard to come by. Because it was so easy to counterfeit paper money on the crude printing presses of the day, paper money was always questionable. Meanwhile, the balance of trade was so heavily in the direction of the colonies that the balance of payments was toward England. What few coins there were, quickly disappeared back to England, while local colonial commerce nearly strangled. The Quakers of Philadelphia all maintained careful books of account, and when it seemed a transaction was completed, the individual account books of buyer and seller were "squared". The credit default swap "crisis" of 2008 could be said to be a sharp reminder that we have returned to bookeeping entries, but have badly neglected the Quaker process of squaring accounts. As the general public slowly acquires computer power of its own, it is slowly recognizing how far the banks, telephone companies and department stores have wandered from routine mutual account reconciliation. From John Head's careful notations we learn it was routine for payment to be stretched out for months, but no interest was charged for late payment and no discounts were offered for ready money. It would be another century before it became routinely apparent that interest was the rent charged for money and the risk of intervening inflation, before final payment. In this way, artisans learned to be bankers. And artisans learned to be merchants, too. In the little village of Philadelphia, chairs became part of the monetary system. In bartering cabinets for money, John Head did not make chairs in his shop at 3rd and Mulberry (Arch Street) but would take them in partial payment for a cabinet, and then sell the chairs for money. Many artisans made single components but nearly everyone was forced into bartering general furniture. Nobody was paid a salary. Indentured servants, apprenticeships trading labor for training, and even slavery benignly conducted, can be partially seen as efforts to construct an industrial society without payrolls. Everybody was in daily commerce with everybody else. Out of this constant trading came the efficiency step for which Quakers are famous: one price, no haggling. One other thing jumps out at the modern reader from this book of account. No taxes. When taxes came, we had a revolution. The Foot of Arch St.
What we now call Arch Street in Philadelphia was originally named Mulberry Street. Just when that change officially occurred could be argued about, but it took its new name from the fact that a road was cut through the high river bank for easier access to riverside shipping, and an overhead arch connected the two cut ends of Front Street at the point of crossing. A model which is still on display in the Friends Meetinghouse at 4th and Arch depicts this arch in place in 1684. The model displays Thomas Holme, Penn's surveyor and map-maker, pointing up at the arch. It is a matter of record that Thos. Holme owned the property at the corner of Front and Mulberry, so presumably the red brick house stranded by the newly excavated street was Holme's. By the time of the Revolution, the Arch Street wharf had become the center of Delaware River commerce. The model depicts that even in 1684, Arch Street led straight to the Schuylkill. The cemetery at 4th and Arch, set aside as early as 1684 as a burying yard, is known to contain at least 40,000 unmarked graves, many of them from the yellow fever epidemics of the late 18th Century. The meetinghouse was built right on top of them, a fact which may now offend some visitors. But it was in keeping with the ancient tradition of burying the dead in consecrated ground of a churchyard, more or less as a sanitation measure. It is also in keeping with the tradition of early Quakers not to allow their pictures to be displayed, or even their names to be placed on tombstones. When disputes arose about warfare in the Revolutionary War, and many non Quakers who had been expelled for one reason or another joined with non Quakers to form the Free Quaker Meeting, it ended up where it is now, at 5th and Arch. The Friends Center , home to the administrative focus of Quakerdom, is at 15th and Cherry, just a partial block from Arch Street. At the time of the construction of the 4th and Arch Meeting, many Quakers moved into the area to be within walking distance, giving rise to the original meaning of the term "North of Market". By the time of the Revolution, the Arch Street dock was the commercial heart of town, and the London Coffee House at Front and Market was the thriving center of international gossip. Tradition has it that it was Bradford, the owner of the London Coffee House, who first got the news of the Stamp Act, and started the agitation which famously resulted. The construction of the elevated "Chinese Wall"of the Pennsylvania Railroad along what is now John Kennedy Boulevard, sliced off the Northern side of town as a quiet fashionable place to live for nearly a century. And while the Benjamin Franklin Parkway was intended to correct this situation, it actually finished "North of Market" as even inhabitable. Things are gradually improving, particularly with infusions of public money, but it takes a long time for such urban scars to heal. Richard Romm, a rising historical scholar with a special interest in early Philadelphia, recently educated the Right Angle Club in the history of the Schuylkill Fishing Club in the State in Schuylkill, and was immediately accepted into membership. Of the Right Angle, that is, which is an old club by some standards, but scarcely a hundred years old in the eyes of the really old, old clubs. The State in Schuylkill is an eating club, originally a fishing and eating club, apparently organized around the annual shad run up the river. The clubhouse, or Castle, was moved several times, in response to damming of the river, and is now located on the grounds of, or adjoining the edge of, Nicholas Biddle's estate on the Delaware River called Andalusia. One by one, the Atlantic Ocean rivers of America have been dammed and their annual shad migrations brought to an end, except through the city of Richmond, Va, so there was little point in moving The Castle to follow the fish. It remains, overlooking Delaware in spite of its name. There seems to have been several name changes, the most important of which was to change the Colony of Schuylkill to the State of Schuylkill for obvious reasons. Originally, the Castle was roughly opposite the falls of Fairmount on the West Bank of the Schuylkill at about Girard Avenue; thus, from 1732 to 1822 located on Baron Warner's property called Eaglesfield. In 1822 it moved to Rambo's Rock (the Rambo family is said to be the oldest European settler family in Pennsylvania) opposite Bartram's Gardens, then finally in 1887 to Andalusia, Nicholas Biddle's country estate. The club was founded in 1732, and dates of movings are possibly hazy, possibly somewhat because of the reluctance of club officers to return the calls of inquiring historians. The State in Schuylkill claims to be the oldest organized men's club in the world, an honor contested by White's in London. The roots of this argument are found tangled in the vital issue of whether their age should be based on the formal organization of the clubs, or on the establishment of the coffee houses which housed the original clubs. Four books are said to have been written about club history, but we depend here on Mr. Romm. There is also an unclear relationship with Chief Tammenend, possibly traceable to the shad run, but in any event to the Indian chief depicted with William Penn in the paintings by Benjamin West and Edward Hicks. May 1 is St. Tammany's day, growing into the fancy that he was the "Patron Saint of America", before a branch of the nation-wide Tammany association opened in New York and sort of tarnished up the name. Other traditions of the Fishing club have to do with wearing Mandarin hats, possibly having to do with the export of ginseng which was once abundant in our colonial suburbs, with a return cargo of Chinese dishware. All of the cooking is done by official citizens of the club. The quantities of food are remarkable; one 19th Century menu listed eleven pounds of meat per member. The club drink is a punch, the famous Fishhouse Punch, widely recognized to be rather strong. Its inventor is reputed to be Edward Shippen Willing, on the occasion of the first visit to the clubhouse by women guests. The quantity of alcoholic beverage at these events is especially remarkable in view of the Quaker origins of many original members of the club, but not necessarily of the guests. Among the various guests were Generals Grant, Meade, and McClellan. Dinner begins with two traditional toasts: to George Washington, and to Captain Sam Morris. Washington was appropriate enough, having a history of drinking a bottle of Madeira every day at lunch. But Sam? Captain Sam the Quaker? Somewhere in this tradition are allusions to the Free Quakers, Quakers who abandoned the peace testimony to fight the British. There is also the tradition of hostility to British rule which antedates the Revolution and may have some connection to the fanciful contention that their little state was not really part of Penn's colony. Captain (of the City Troop) Sam was a stalwart, possibly the sole founder, of the Gloucester (N.J.) Fox-hunting club. The history is passed down that 22 of the original 26 members of the First City Troop were members of the fox-hunting club, and many if not most were Quakers. The first "Governor" of the State in Schuylkill was Thomas Stretch, but the second Governor, from 1766 until his death, was Captain Sam. He was repeatedly referred to as the life of the club and held in the highest esteem by all. He was "read out" of the main Quaker Meeting, not so much for his drinking as for his flouting of Quaker belief in pacifism. He reputedly led a saber charge at the Battle of Trenton and was a leader of the City Troop in that revolution within a revolution at James Wilson's house, which rescued at least four future signers of the Constitution from a mob of militia which momentarily turned Jacobin. Naturally, descendants of Quakers on both side of this uproar have been reluctant to say much about it. But somewhere within the history of Samuel Morris must be some important clues about the 18th Century splits within the Quaker Church, to say nothing of the revolt of the three Quaker colonies against British rule. The Wesley brothers converted so many Americans to the Anglican church, they couldn't ordain enough ministers. Reluctantly, Americans were allowed to ordain their own ministers. When the Revolution was over, they had drifted into a new Protestant denomination. This old local expression originally pointed to where the Quakers live on Arch Street, but over the centuries has taken on a lot of less flattering associations. It's only open a few days each year, but the red brick building at 5th and Arch was the meeting house for those few Quakers, including Betsy Ross, who fought for the Revolution. The Park Service has made a beautiful restoration, which deserves to be seen by more people. Two of our oldest and most charming tourist attractions are just across the street from each other..
Charles Townshend and William Bradford were separated by an ocean, and surely never met. But if any two people can be said to have deliberately provoked the American Revolution, these two must be considered. The equivalent of the rosetta stone for colonial commerce had been sitting on George Vaux's shelf for six generations. Thirteen stars and stripes became the National Flag in 1777, but a rather similar flag was the National flag from 1775-1777. It was also designed by a Philadelphia milliner, Margaret Manny. The foot of Arch was once the center of town, and Arch Street from the Delaware to the Schuylkill was the center of Quaker life for two centuries. Unless you listen to some quibbles from White's in London, the Schuylkill Fishing Club of the State in Schuylkill is the oldest organized men's club in the world. And even if that exception is admitted, it's the oldest men's club in America. It's not secret, but it's very private.